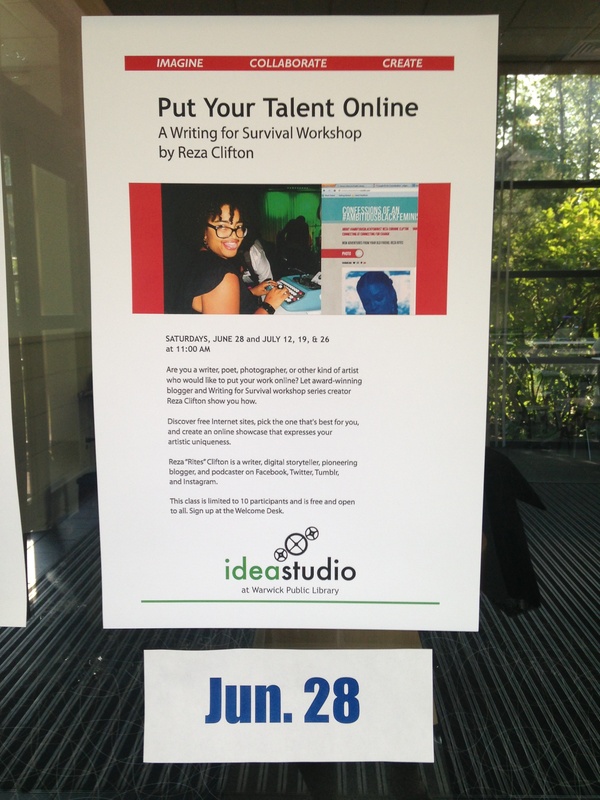 Starting Saturday, June 28, join me, Reza Rites, for the second Writing for Survival workshop series being held at Warwick Public Library, “Put Your Artist Artistic Self Online.” The classes will run from 11 AM – 12:30 PM on June 28, July 12, July 19, and July 26, and each session is free and open to public. Registration is required and there is a class-size limit, so register today. Click here for more details and to sign up for the WPL class. 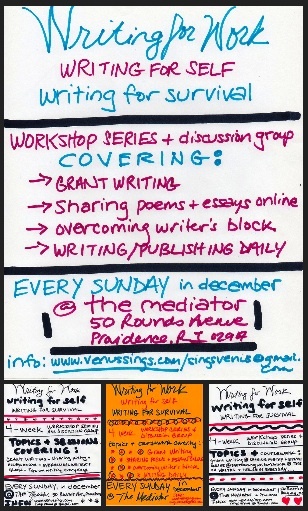 For more information or to talk to me about organizing/scheduling a separate or private series of Writing for Survival workshops, email me at singsvenus@gmail.com or call 401-217-9680. 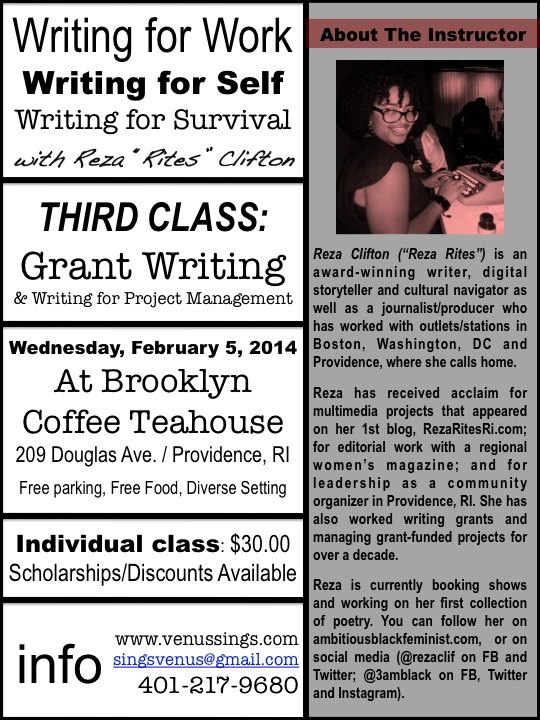 MARCH 14, 2014 – Click on the photo or here to find out about the current series of Writing for Survival workshops currently being taught by Reza Rites at Warwick Public Library. To inquire about attending the last two workshops in March, email Reza at singsvenus@gmail.com or call 401-217-9680. 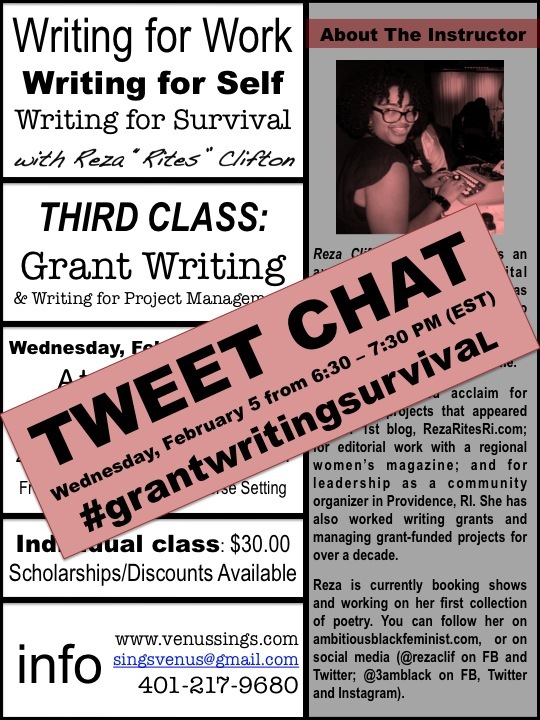 Due to the success of the February 5 Tweet Chat on Grant Writing – and feedback I’ve received about Wed nights being difficult for many folks – the fourth and final class in this round of Writing for Survival Workshops will also be moved to social media. Join the (free) TWEET CHAT on Sharing Poetry, Essays and Your Brand Online this Wednesday, February 12, 2014 from 6:30-7:30 PM. 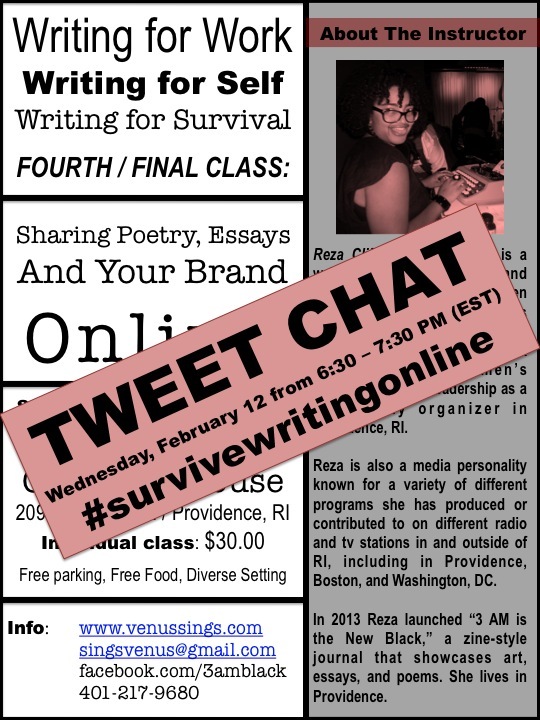 More information about the Writing for Survival series is below and on www.venussings.com. Plus more sites coming soon. Due to the inclement weather we’ve already received – as well as predictions for more this evening – today’s grant writing workshop is GOING DIGITAL! Join the Grant Writing and Writing for Project Management (free) TWEET CHAT happening today, Wednesday, February 5, 2014 from 6:30-7:30 PM. Participants offering tips and addressing inquiries during the social media conversation include Hilary Jones, Executive Director of Girls Rock! 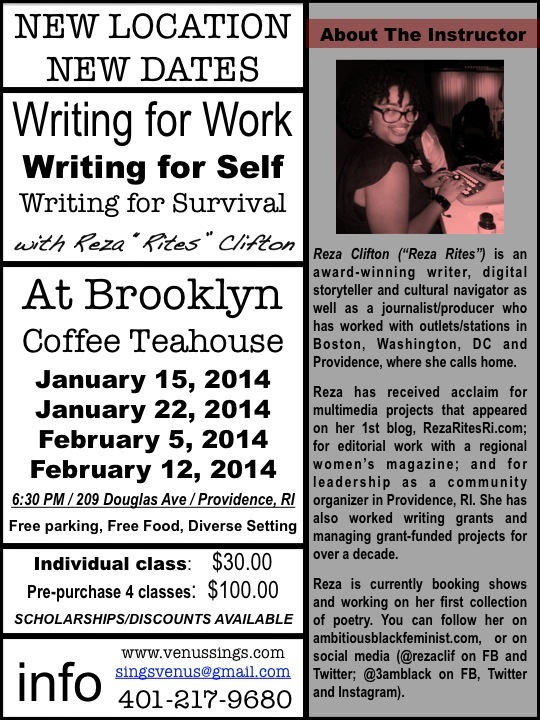 Rhode Island and Reza Clifton, founder/instructor of the Writing for Work, Writing for Self, Writing for Survival workshop series. Hello friends, bad news: Due to the weather, I have to cancel today’s Writing for Survival class, which dealt with Writing for Drama and Performance and Writing for Public Speaking. 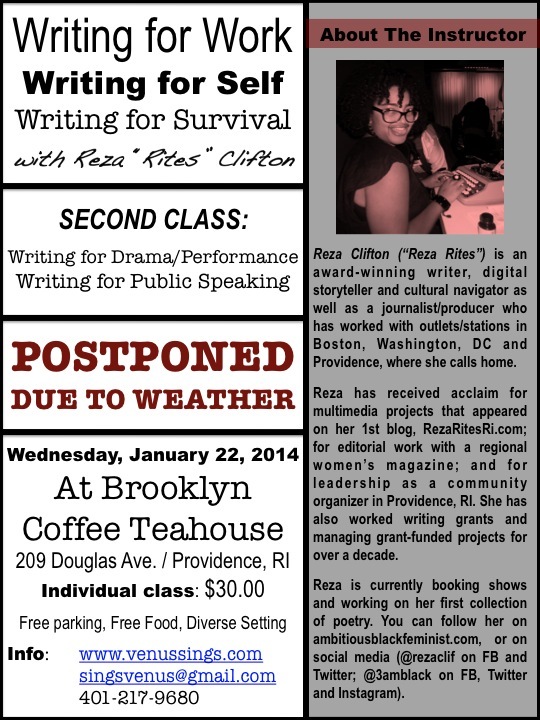 Good news: Class 3 is still on and scheduled for Wednesday, February 5, 2014, 6:30 PM at Brooklyn Coffee Tea House. The topic of that workshop is Grant Writing and Writing for Project Management. PROVIDENCE, RI – Need help with your writing? Looking to share what you’ve composed with a larger audience? Time to start securing grants for work? There is help available. “Writing for Work, Writing for Self, Writing for Survival” is a workshop series that’s been running in December under the leadership of Reza Clifton – an award-winning writer and media producer who has written creatively for nearly 3 decades and as a journalist, project manager and grant writer for 10 of those years. The Writing for Survival workshop series consisted of sessions on writing daily and overcoming writer’s block, writing and presenting for drama and performance and writing to win grants and manage projects. 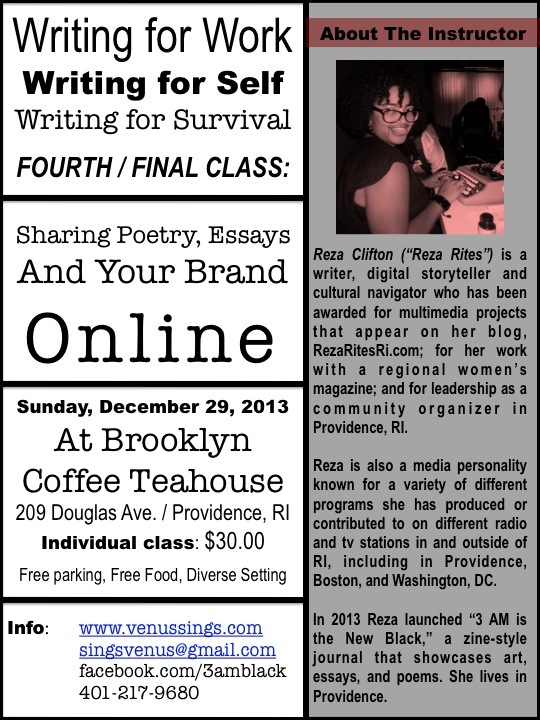 The final session in this run of the series is happening on Sunday, December 29, 2013 at 3:30 PM, and the topic will deal with sharing poetry and essays (and your brand) online. Attendees will be able to pay for the class ahead of time (via paypal links available on VenusSings.com and on the corresponding Facebook page), or on the day of the class, and scholarships/discounts are available (email singsvenus@gmail.com to inquire). The session is open to the public, and interested community members can register and participate even if they have not attended an earlier workshop in the series. This Sunday’s event will be held at Brooklyn Coffee Teahouse in Providence, RI, 209 Douglas Ave. The prior three sessions were held at The Mediator Fellowship, 50 Rounds Ave. in Providence. Information about another offering of the four-part “Writing for Survival” Workshop Series, to be held at Brooklyn Coffee Teahouse, is coming soon. For more information or to be added to Clifton’s email list, conact singsvenus@gmail.com or call 401-217-9680. For more information about The Mediator space, visit http://www.facebook.com/Mediatorfellowship. For more information about Brooklyn Coffee Teahouse, visit http://www.brooklyncoffeeteahouse.com. “Writing for Work, Writing for Self, Writing for Survival” is a workshop series being organized and led by Reza Clifton – an award-winning writer and media producer who has written creatively for nearly 3 decades and as a journalist, project manager and grant writer for 10 of those years. The Writing for Survival workshop series will include sessions on writing daily and overcoming writer’s block, writing and presenting for drama and performance, writing to win grants and manage projects, and sharing poetry and essays online. 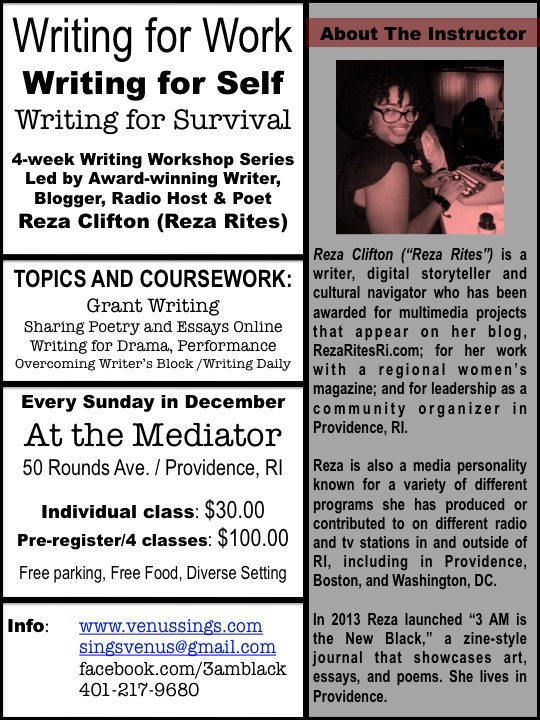 The classes will be held every Sunday in December at The Mediator Fellowship, 50 Rounds Ave. in the Reservoir Triangle section of Providence, RI. Attendees will be able to pay per class ahead of time or on the day of the class. Interested participants can all also pre-register for all four sessions at a discount, and scholarships/discounts are available (email singsvenus@gmail.com to inquire). The second class will be held Sunday, December 8 from 3:30-5:30 PM and the topic is Writing for Drama, Performance, and Public Speaking. For more information, email singsvenus@gmail.com or call 401-217-9680. Click here to purchase the four-class package.